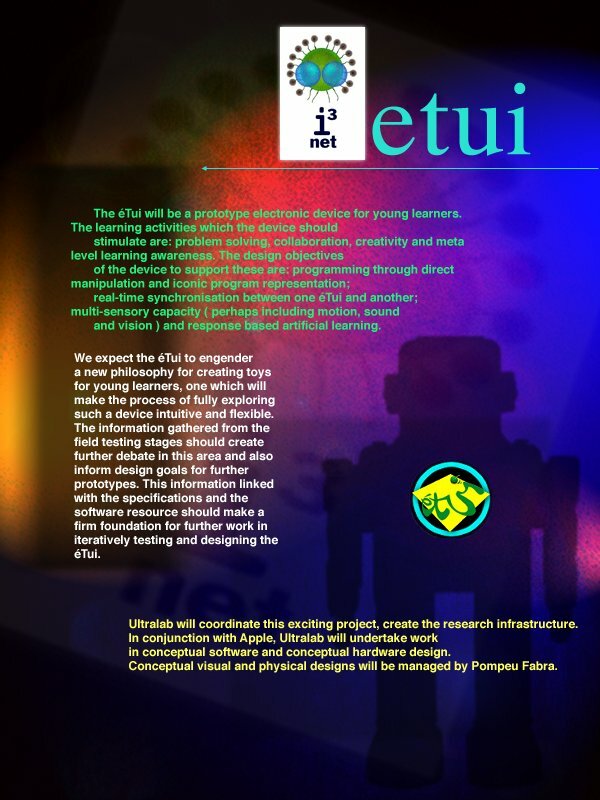 There is so much to say about the éTui project, that it has taken me almost a decade and a half to write it up! But the works needs a narrative - for the sake of Weiya Wang, Andy Simpson, Kris Poppat, Carole Chapman, Josep Blat, Dai Griffiths, Terje Rydland, Richard Millwood, Tom Smith, Lys Chandler (now Johnson), Greta Mladenova, Jonathan Furness, Leonie Ramondt and the many others across Europe who contributed. It is certainly one of the projects I am most proud of from the remarkable Ultralab days. Rather cleverly Any Simpson used FileMaker Pro to build a paper writing engine to generate the vast numbers of reports that an EU project will always need. I'm still working on extracting them for these pages - watch this space! Here is the original proposal as a pdf though. The project started in 1997 and ran for 2 years, with a few outcomes in 2000 too. The EU had a notion back then, a good one, that a European MIT might be a useful thing but could / should be a distributed virtual thing, building on the many good research teams already doing remarkable work - our's included. The resultant i3 project began with a number of calls for collaborative research which with pals in Trondheim University and Universitat Pompeu Fabra in Barcelona, we responded to, offering outcomes and deliverables in the usual European Workpackage Plan format. The plan was simple: build "smart" little programmable toys for 4 - 8 year olds where a primary intention was to see them reflect on their own learning as a result of reflecting on the little toys "learning" as they programmed them (remember that the 4 year olds were pre-notational, so that the programming task design was interesting). The complexity came because we wanted to develop the whole programme of toy design in conversation with, and in response to, our Learners' voices and that needed a proper on-line community of practice, across cultures, with quite small children. Luckily, Carole Chapman's uniquely early Learning in the New Millennium project - from 1993 - 2000 had pioneered these communities of practice and she was able to build a community in First Class to do that for our éTui collaborators to use too. it shows some of the conversations we held with the young lelarners and centrally it shows one of the nearly finished éTui toys. The toys we ended up with were certainly engaging: obviously with children as young as four using them they needed to be programmed without a keyboard. They could be programmed by flashing light at them, by pushing them in a shape / pattern, by making them follow lines or head for light beacons, and so on. The little finished toys were dressable - came with varied colours, had three central sensors that could be bent to seek lines, look out for light beacons and so on. The toys communicated with each other too - they could elicit group as well as individual behaviour. We spent time giving the childrenall sorts of alternatives - in size, weight, in programmable functionality - and their feedback was always reflective and helpful. Some features were imagined, but were then too expensive to fit - we wanted to fit GPS, and accurately predicted its cheapness and ubiquity, but it was too expensive at the prototype stage to invoke. Here Carole and Andrew chat to some of our collaborating students about some toys we gave them, that they had tried - Furbies, George, etc. "20 years ago toy shops were full of little programmable toys: trucks, cute "robots", turtles and more. These toys delighted children who then struggled with the notation needed to actually control them. As a result the "programmable toy" slipped out of sight from shops although children were still hungry for interactive toys that they could control. In more recent years the ability to put some real interactivity back into toys has been delivered by new (cheaper) chip technologies and the beginnings of a new generation of delightful toys are appearing. These are not Furbys or Tamagotchis but something well beyond them. This evening at BAFTA explores the trend towards smart, programmable toys, and shows some of the emerging work at the cutting edge of this field that may just be appearing in sacks for Christmas 2002. And it'll be lots of fun too, but mind your ankles!" And this MP4 movie interviewing some of the key participants (although not showing Weiya who did all the hard engineering and electronics) about the whole project, is certainly worth a watch (QuickTime version is here). So, the short version of all this was: it worked. the children were insightful. At one point we added "eyes" to make then cuter. The children asked 'can they see properly now?" and we said "No". So they said "why have thery got eyes then?..." Fair point! they DID reflect on their own learning, even at 4. Despite the literature suggesting that they couldn't / wouldn't. They would watch the little éTui trying to find its way out of a maze and they'd say to it "oh you silly thing, that's not how I'd do it..." and we would cheer and feel smug. 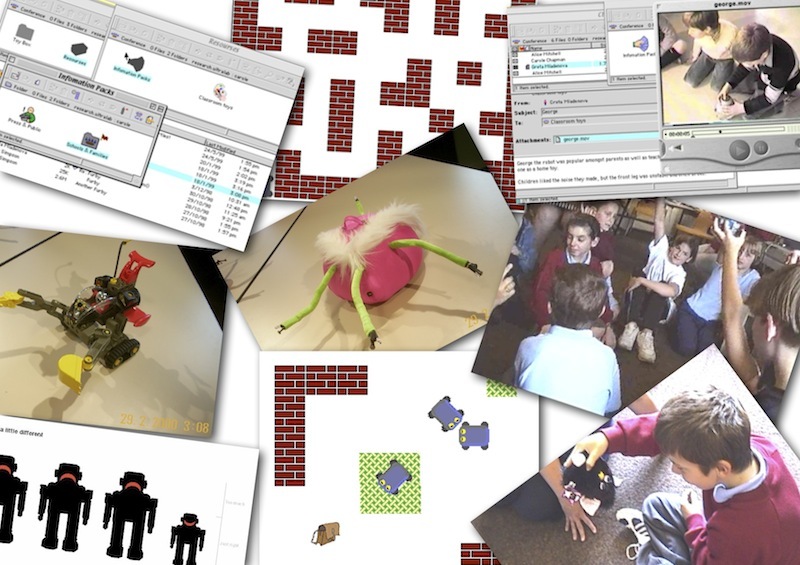 our youngsters moved freely between the actual physical prototypes, the virtual simulations and the abstract conversations about what might be possible. after we had the project completed I happened to be passing a pub near the City of London on a Friday night with a few éTuis. The place was - even in those days - full of bankers celebrating another week of ££ and $$. I turned the éTuis on, set them loose and... within very short order the banking folk were down on the floor playing and chatting about Learning. The engaging and seductive nature of the children's design worked for big folk too. It is only now of course (2012) that the corporate sector folk are understanding the significance of this - and are pouring into Learning events to find out how to move their Training Managers and training budgets and training facilities into the learning support that they need if they are to become the agile Learning Organisations that the smart ones aspire to be. éTui in French has meanings which include a "small precious container" - perhaps like a small purse - and certainly we envisaged them being pretty pocket-sized. But in the iterative loop of asking children, then delivering on their design ideas, we asked a little girl about the ideal size: "you can make it any size you like", she said "...as long as I can ride it home from school". Now that IS an engineering and programming challenge... but I have a feeling that she may yet get her dream éTui - or certainly something very much like it - somewhere round 2025? In the end we built them in the shell of cycle helmets - bigger than we expected, smaller than her dream of rideably sized!